Monster powers were special attacks a monster could make outside of or to replace a melee attack. These effects have been in the game since the original edition. totally digested and irrecoverable. Purple Worms never check morale and will always attack. 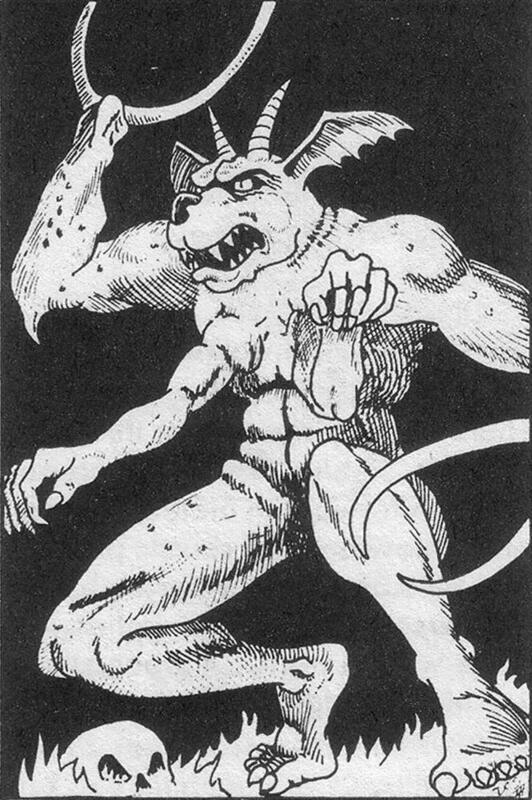 TYPE III DEMON: Towering to well over nine feet in height, this not unusual kind of demon has a ghastly appearance, being broad and strong-looking, covered with a wrinkled hide, with a head much like a goat-horned dog, pincers instead of normal hands, and a small pair of human arms protruding from its chest. Magic resistance is 60%. Intelligence is medial for demons. Normal attacks will affect this demon type. It causes darkness in a 10' radius when it so wills. Additional abilities, any one of which can be performed at will, are: Fear (as a fear wand), levitate (as a 10th level magic-user), cause pyrotechnics, polymorph itself, telekinesis 4,000 gold piece weight, gate in another demon of types I-IV (roll for which type) (30% chance of success). it first came out. finally fire beetles could do something with those sacks of lava on their butts! I try to give most of my monsters special powers, and those that don't have them, like humanoids, I mix up with alternate arms armor. Great blog, thanks. I just recently read of fire beetles in one of the Elric books ... funny running into them in a comment like this.